Biotechnologies for smallholders: new publications – One Billion Hungry: Can We Feed the World? Biotechnologies, as seen from the case studies, can boost yields, improve quality and market opportunities, reduce costs and thus improve agricultural livelihoods for smallholders. As the report emphasises, however, biotechnologies will only work for smallholder farmers if smallholders participate in the design, research and dissemination processes. 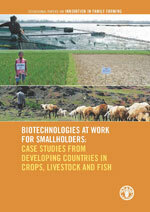 While the case studies presented in the publication can provide guidance to policy makers in designing biotechnology-based programmes, the wider enabling environment for the introduction and adoption of such technologies also needs to be addressed, for example, long-term investment in national physical and social capacity and greater cooperation and knowledge exchange across borders. One of the barriers to the use of biotechnology in developing countries is the transfer and adaptation of technologies from one place to another. In a policy report from the International Food Policy Research Institute (IFPRI), also recently launched and entitled, Private sector agricultural technology transfer into Bangladesh, Kenya, Senegal, Tanzania, and Zambia, the process of private technology transfer and the interaction between governments and private research is examined. Based on survey data from 126 organisations, interviews and other sources, the report looks at various forms of technology being developed in private companies such as pesticides, machinery, fertilisers and hybrids. The report aims to illuminate ways in which governments and donors can utilise and promote private research and understand the factors that can hinder it. IFPRI has also published a book entitled, Genetically Modified Crops in Africa: Economic and Policy Lessons from Countries South of the Sahara, which evaluates the potential benefits, risks and impacts of GMOs in sub-Saharan Africa. Using existing studies on GM crops in terms of economics, consumer perception and trade impacts, authors conclude that, on average, GM has been largely positive for the economies of adopter countries. The book also makes suggestions for how the benefits of GM might be boosted, for example by developing biosafety regulations that do not make GM crop development “prohibitively expensive”, by developing policies to enable intraregional trade in GM crops, and by supplying concerned consumers with quality information about GM (although there is an assumption that it is a lack of data that makes consumers sceptical of GM). Across these three publications there is a clear desire to make new technologies, whatever the source, work for developing countries in ways that contribute to poverty reduction and economic growth. A large part of the success of new technologies will be, as stated in One Billion Hungry, that they are appropriate for smallholder farmers and only smallholders know what is appropriate for them.